Can be supplied as freestanding, peg boarded or mounted to a wall. 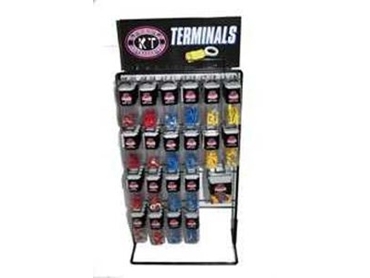 KT Cable Accessories has released the KTFFH/S fuse and fuse holder stands and KTATMIX/S terminal displays. They are bar coded with transparent packaging. The display stands are tailored to individual customer needs and can be supplied as freestanding, peg boarded or mounted to a wall.